A specialist has advised Richard Commey to rest his injured right hand for six to eight weeks. That’ll prevent the IBF lightweight champion from fighting Vasiliy Lomachenko on April 12 at Staples Center in Los Angeles. Commey visited the specialist Thursday for a second opinion. Lou DiBella, Commey’s promoter, informed Lomachenko’s handlers at Top Rank Inc. on Friday that Commey will need nearly two months to rest his hand. Carl Moretti, Top Rank’s vice president of boxing operations, told BoxingScene.com on Friday that Top Rank is exploring potential replacements for Commey (28-2, 25 KOs). A doctor first told Ghana’s Commey on Tuesday that he suffered a floating tendon near the middle knuckle of his right hand during his victory over Isa Chaniev on Saturday night in Frisco, Texas. 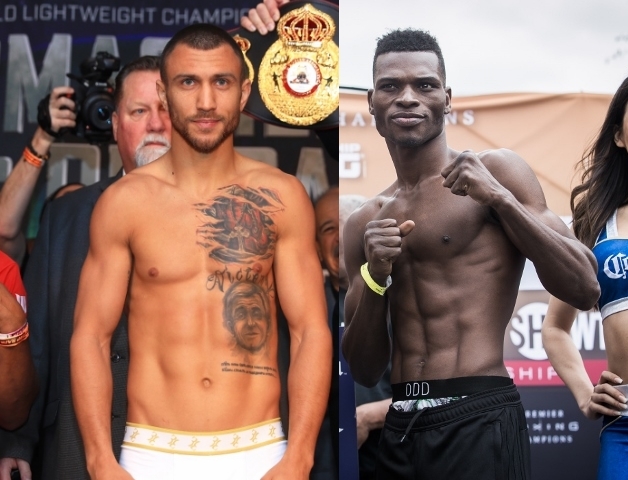 Commey told a group of reporters following his second-round stoppage of Russia’s Chaniev that he thought his hand injury could prohibit him from fighting Lomachenko at Staples Center in what would’ve been a lightweight title unification fight. A purse bid for Lomachenko’s mandatory WBA lightweight title defense against Anthony Crolla is scheduled for Wednesday at the WBA’s headquarters in Panama City, Panama. Regardless, Lomachenko will not fight Crolla next. Lomachenko’s handlers had hoped Commey would need a shorter amount of time to rest. If that were the case, promoter Bob Arum was willing to move back Lomachenko’s next title defense a few weeks. If Lomachenko wins against an optional opponent April 12, the Lomachenko-Crolla fight could be scheduled for sometime this summer. Theoretically, Eddie Hearn, Crolla’s promoter, could win a purse bid and bring a Lomachenko-Crolla clash to the United Kingdom, where Crolla (34-6-3, 13 KOs) is a proven ticket-seller in his hometown of Manchester, England. Crolla, despite his championship pedigree and three-fight winning streak, would be viewed as such a massive underdog against Lomachenko it likely would negatively impact ticket sales and pay-per-view buys on Sky Sports Box Office.